Commentary: Given the hubbub about Han Solo it remains to be seen if this is going to be a big deal. If the movie is good, his higher casepack means you'll be glad you can get him. If not... well, Rogue Redux I guess. 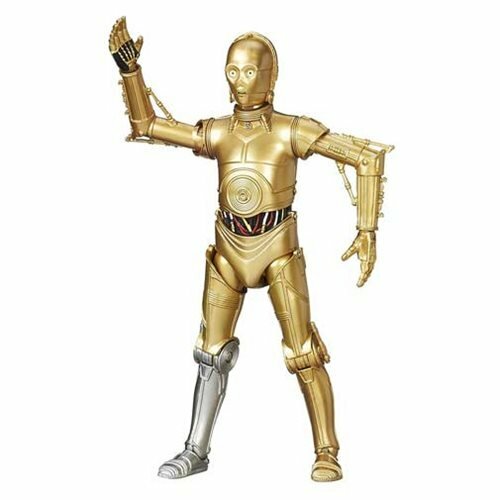 What we have here is an excellent action figure of a popular character, but even in a good year classic Han Solo isn't the draw it once was. There's a reason he wasn't in rotation all the time, and now we're seeing him as the focus. Is this a good thing? It might be. I hope it is. Please buy stuff. 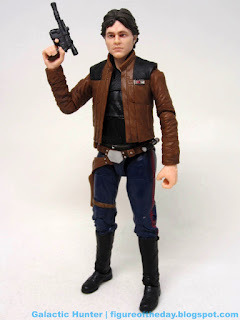 Han is a good figure - it looks like Alden Ehrenreich in a Han Solo-esque outfit. 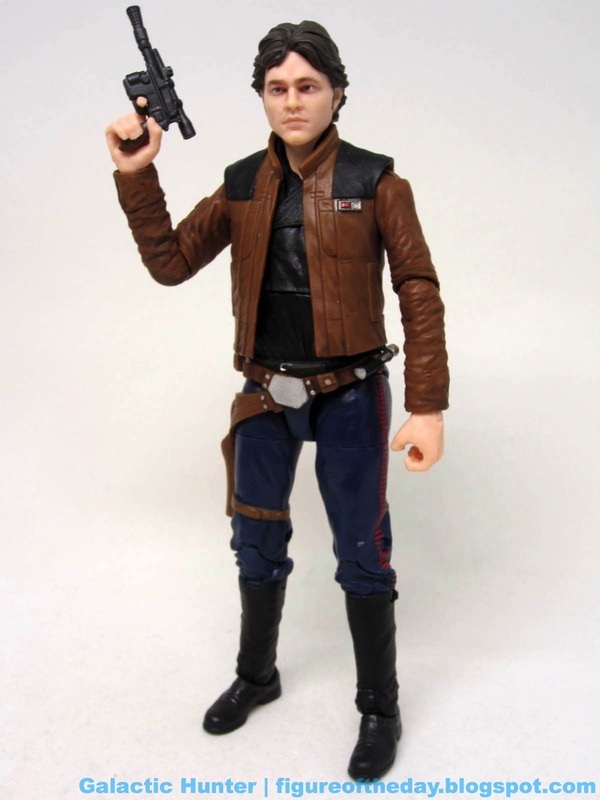 The vest and jacket are gone, as is the 1990s licensing mantra of "Han Wears Black." (See: Galoob products, 1995-1998.) The shirt is black, the jacket is brown, and there are shoulder patches. 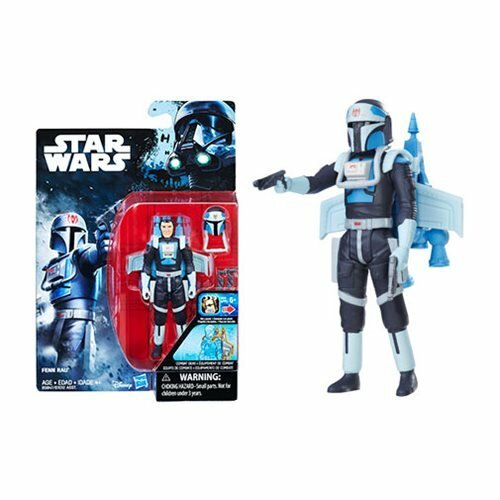 It looks pretty cool - and he can hold his blaster, or you can put it in the familiar holster, on the familiar pants, with familiar boots. From the waist up, he looks like a whole new man. From the waist down, you've seen figures like this before. The sculpting is really sharp, but the Ehrenreich likeness is pretty impressive. Sure, I've only seen him in Hail, Caesar! but this looks a lot like the singing cowboy doofus I remember and the smuggler I'll see in about a month. The new printing technology is pretty great, with shiny eyes and a soft-but-good printed-on likeness on a great sculpt. 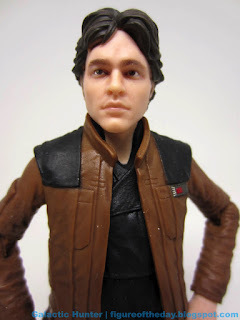 It's so good, I'd say it adds fuel to the fire of the long-running rumor of Kenner and Hasbro's Harrison Ford likenesses being intentionally iffy due to how contracts were signed. 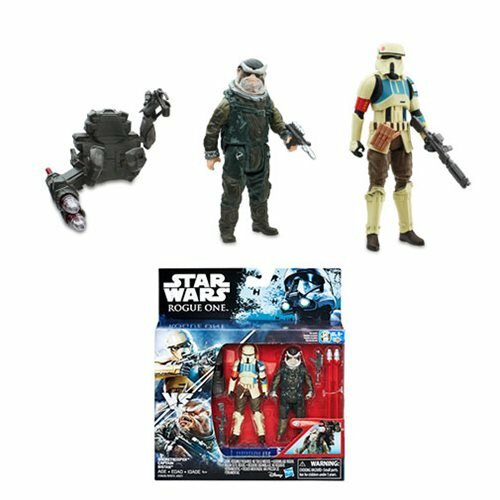 If things can get this perfect, Hasbro either needs to go back and try again or come clean about how these are off for a reason. I know faces are hard to capture properly, but New Han and New Lando are astonishing. What I found particularly amazing on these figures were the elbows, which have an increased bend compared to even some of the double-jointed elbow figures of old. Hasbro really did a bang-up job making these figures look awesome when you pose them, no doubt influenced by other similarly sized products from Japan. If Hasbro can give you a better product at a fraction of the price, their future just got a little bit brighter - as long as they can keep the reins on which characters get made and what the market wants as far as quantities go. There are stories there. Hopefully they will share them some day. Han's blaster looks like Han's blaster, so you get everything you as someone who has not seen the new movie should expect. It's a good likeness, with good articulation, good paint, and good sculpting. It may not be 100% true to the final movie, as these figures were pretty much designed prior to the current director coming on board. With reshoots, things may have changed - I don't know. I just know what I see is good, and hopefully what we see in the theaters will be equally good. If you've got cash burning a hole in your pocket, you should get one of these. Now I want a matching new Chewbacca, please and thank you.